Udith Narayan Live in Concert is a unique concept created to reach the masses and an opportunity to all Sri Lankans to witness a concert of an international flavour. This is a first event in Sri Lanka ever to happen in the entertainment industry and it’s surely going to take Colombo by storm. It is due to take place on March 11 at Galle Face Colombo. The event will showcase power packed sound and lighting system with an array of entertainment acts with vibrant segments. It will be catered to the masses and its one of a kind 1st time experience to all. Understanding the social responsibility towards the mother land and war heroes The State Minister of Defense Ruwan Wijewardene has advised and initiated the project to be beneficial to all publics of all segments and ‘Colaba Api’ and Ceylon Exhibition will be the organizing arm for this worthy cause to facilitate to the event to the low income earners of the country. The profit collected from the event will be partly donated to the National Kidney fund and war heroes of our mother land which will be will be utilized for the treatment of people who are affected. 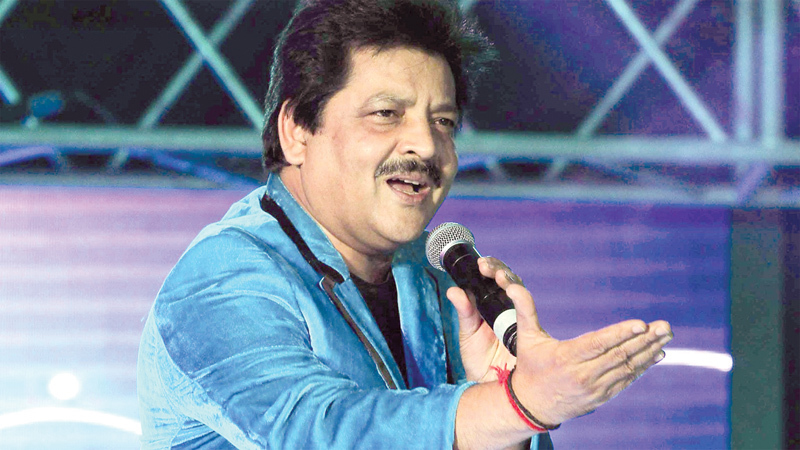 Udit Narayan is one of the most popular singers of the Hindi film industry. This multi-talented playback singer has sung in numerous films and in many different languages. This great singer was born in a small village named Bharadah in Nepal. His initial years were full of struggles and he started off his career with a brief stint with the Nepal Radio. He used to sing Maithili, Nepali and Bhojpuri songs during the 1970’s. He got his break to sing in a Hindi film when music director Rajesh Roshan offered him to sing in the movie Unees Bees. It was big thing for Udit, as he got an opportunity to sing with his mentor, the great Mohammed Rafi. He was noticed but his real big break came in the year 1988. He sang a very famous song “Papa Kehte Hain” from the movie Qayamat Se Qayamat Tak, which went on to become that year’s biggest hit. This song gave him instant stardom and he went on to bag his first Filmfare award. This movie was also the launch pad of actors Aamir Khan and Juhi Chawla and female playback singer Alka Yagnik. Udit Narayan is one of the most acclaimed singers of the present generation and has been praised by senior and established singers and composers for his original style and voice quality. He is the onscreen voice of the three major superstars of Indian cinema namely Shah Rukh Khan, Aamir Khan and Salman Khan. Many acclaimed music directors prefer to work with him since he is able to gel with almost everyone and give the exact feel to the song. He is one of the top choices of acclaimed music directors like A.R. Rahman, Nadeem Shravan, Rajesh Roshan, Shankar Mahadevan, etc. He is also a hit with major directors like Yash Chopra, Sanjay Leela Bhansali and Karan Johar. Some of his superhit movies are ‘Darr’, ‘Dilwale Dulhaniya Le Jayenge’, ‘Kuch Kuch Hota Hai’, ‘Dil Toh Pagal Hai’, ‘Mohabbatein’, ‘Swades’, ‘Veer Zaara’, ‘Aashiqui’, ‘Lagaan’, ‘Taal’, ‘Beta’, ‘Rangeela’ etc.